But can he hit lefthanded pitching? Miami Heat star LeBron James is teaming up with Red Sox owners John Henry and Tom Werner in a deal that brings the basketball superstar together with the parent company for the local baseball team. The Celtics' nemesis' deal with the Sox owners gives James a minority stake in Liverpool Football Club (LFC), which Fenway Sports Group (FSG) -- led by Henry and Werner -- purchased in October. The Fenway group will partner with James's sports marketing firm, LRMR Branding & Marketing to become the exclusive representative for James. As part of the deal, James obtained a piece of LFC, one of the world's most famed soccer teams and a longtime marquee franchise in the English Premier League now owned by FSG. The 26-year-old James will work with FSG via Fenway Sports Management (FSM), the sports marketing arm of FSG established in 2004. FSM has Boston College sports, the Deutsche Bank PGA golf championship, Roush Fenway racing, Liverpool FC, and Professional Bull Riders among its client base. "I can't even explain the level of excitement that we have right now," James' manager and LRMR CEO Maverick Carter told the Associated Press. "As far as my business career goes, it's one of the most exciting times. And the opportunity for growth for us is huge. The guys at FSM understand it too and they probably see it even more than we do." The deal came together quickly, but Carter and James have been familiar with Henry and Werner for some time. Their relationship was born, in part, through mutual acquaintances with Berkshire Hathaway — billionaire Warren Buffett's company. And that relationship between James and the Red Sox owners presents a bit of irony — after all, James is a devout Yankees fan. "It's strictly business. ... It's very humbling," James said. "That's the great thing about sports: It brings people together," Carter said. "And this is about business." Werner believes this will be a powerful collaboration between FSG and LRMR and LeBron. "There are very few athletes who can match his global reach, appeal and iconic status,” Werner said. “We are very excited that LeBron will be part of the Liverpool FC family. LeBron and Liverpool each has a powerful presence internationally, with particular strength in Asia, but we feel the business opportunities for both working and being identified together in emerging international markets will result in unforeseen opportunities that neither would have been able to realize alone." Red Sox chief operating officer and FSM president Sam Kennedy said Wednesday that the group is not looking to get into representing individual athletes, but the chance to work with a blue-chip brand such as James was too good to pass up. 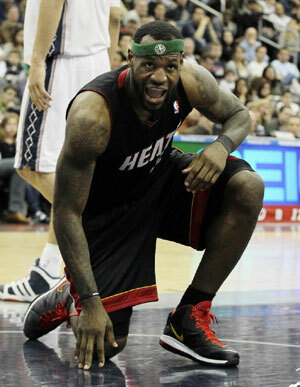 "What FSM does for Roush Fenway, Liverpool, and the Red Sox, we will now do for LeBron James," Kennedy said. "We will aggressively pursue business opportunities for him." James has pursued marketing opportunities across the globe before, especially in Asia and Europe — obviously, two key markets for Liverpool as well. James stressed that the relationship is a partnership, one brand helping another, and that LRMR's operations aren't being essentially taken over by FSM. "We're not interested in talent or athlete representation but we think he is one of the most remarkable athletes of his time," Werner said to the Wall Street Journal on Tuesday. "We believe we can open doors for LeBron and LeBron can open doors for us." James said he was "humbled" by the deal. "The first time I stepped on an NBA court I became a businessman," James told the Journal. "This is a great opportunity for me." "There are very few athletes who can match his global reach, appeal and iconic status," Werner said. "We are very excited that LeBron will be part of the Liverpool FC family. LeBron and Liverpool each has a powerful presence internationally." “LeBron shares our love of all sports and we are very excited to make him part of the Liverpool family," said Ian Ayre, Managing Director of Liverpool FC. "We look forward to working with LeBron, LRMR and FSM, and exploring the business opportunities this new relationship could bring forth both here in the U.K. and abroad." “Liverpool is one of the most important clubs in all of sports, and I am excited to be affiliated with this incredible organization,” James said. The news of James' ownership stake in LFC has lit up the football club's online discussion forum. "Can he play left back?" was one question that was posted. "It may have an impact in Asia, where Lebron is a God," wrote another veteran forum member. "What people don't realise though is that while he is one of the most hated athletes around, he's also one of the most popular. For every guy who hates him there is one who idolises him." Kennedy said the partnership represented a new way of thinking about the sports marketing business. "Eighteen championships," James said to the Journal regarding Liverpool's success. "I see myself trying to do the same things they have."